Barbizon Lighting Company Blog: Barbizon Lighting and LDI - During & After the show! 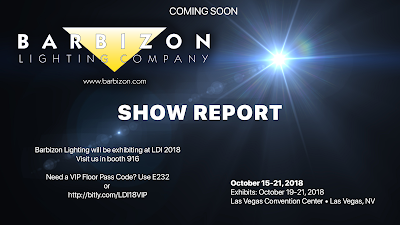 Barbizon Lighting and LDI - During & After the show! Headed to LDI Next Week? Are you headed to Live Design International (LDI), the entertainment industry's annual gathering, to see the latest in entertainment tech? Stop by and say hello! Barbizon Lighting employees from across the nation will be converging on the Las Vegas Convention Center and you can visit us in booth 916 and we can discuss all your upcoming lighting needs. If you don't have your floor pass yet, there's still time to get a free exhibits-only pass from us. Just visit the URL http://bit.ly/LDI18VIP. Not able to attend - we can help there too. Check out our comprehensive LDI Show Report. Get the facts about the latest in the industry, compiled by our LDI Show Team for you to read all in one place!